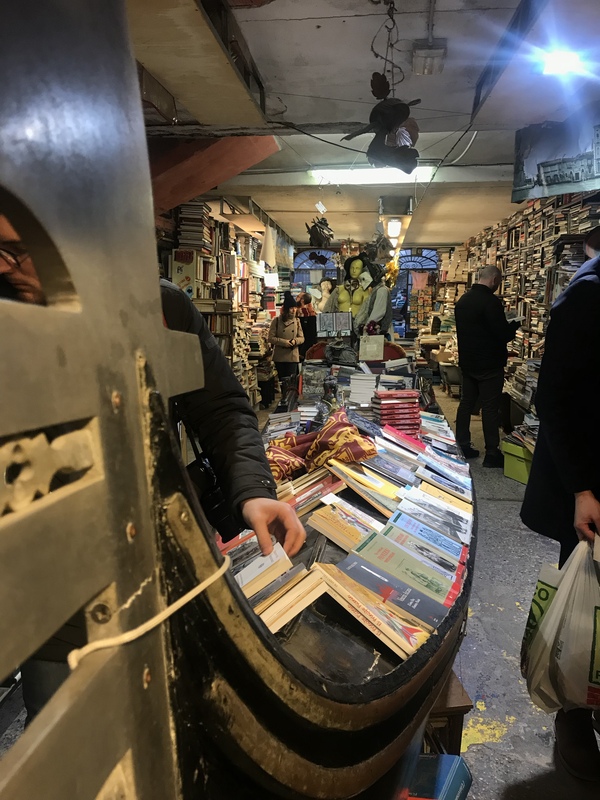 If you’ve ever been to Venice in the colder months, you’ll have no doubt seen what looks like trestle tables stacked up in random corners of the city (go on, Google it – I’ll wait). The city is not perpetually prepared for a giant street party; it’s ready for acqua alta. 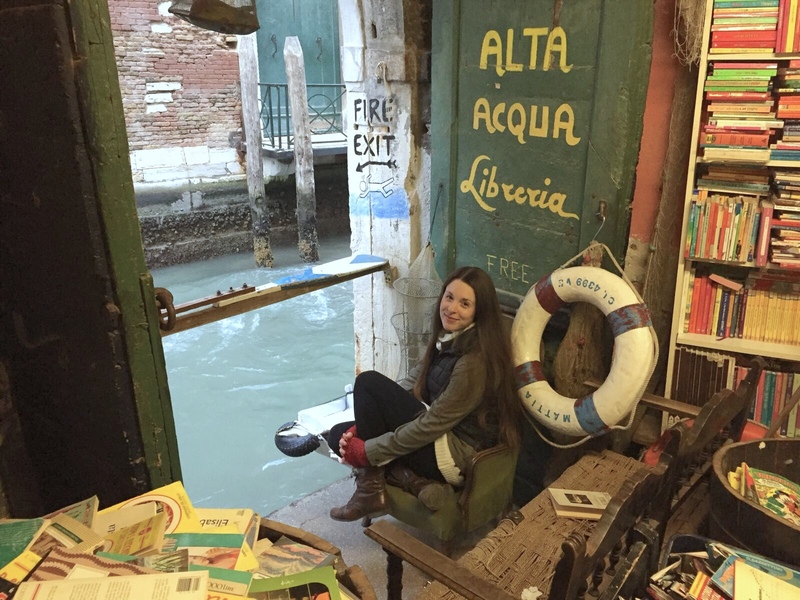 When the tide rises, the waters of the Adriatic Sea come roaring in, and poor little Venice dips even further under water for a while! Those trestle tables go up to be used as elevated walkways (called passarelle), and everyone tries to keep their belongings and merchandise dry. 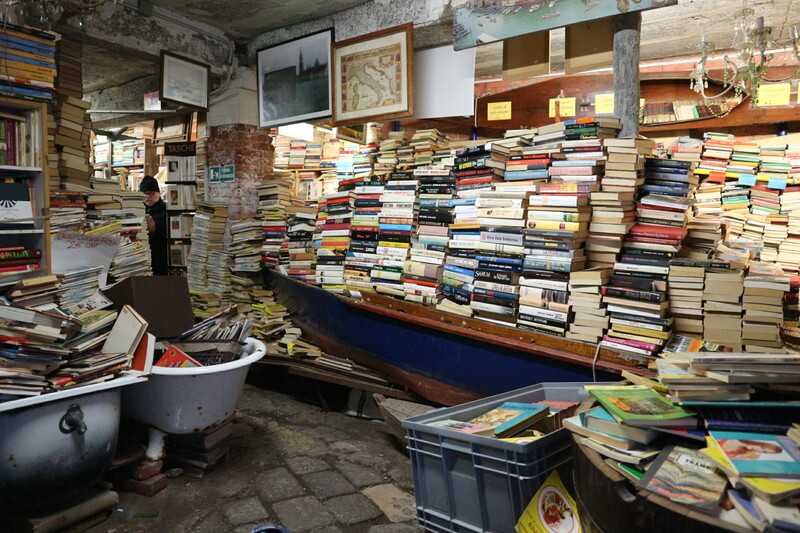 Luigi found a novel solution for the bookshop he named after this natural inconvenience, which he opened in 2004 – he put his books in water proof bins, small boats, bathtubs, even a gondola, parked in the middle of the store. 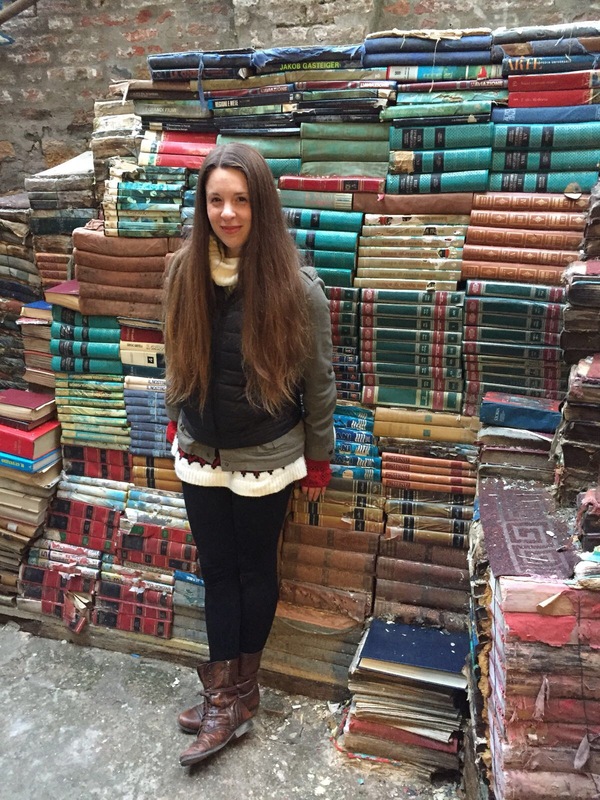 When you open a store full of books on an island that’s slowly sinking, you have to take some extreme precautions! 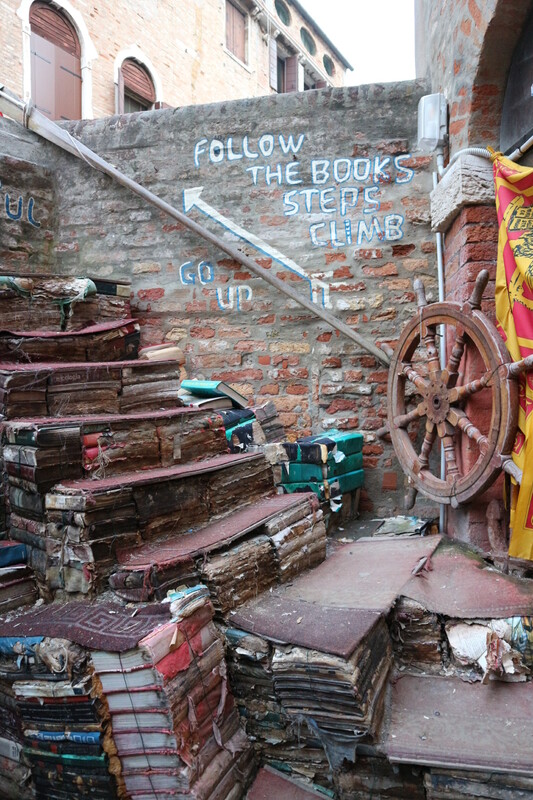 It’s a haphazardly arranged shop with both new and old tomes, a fire escape that leads to a canal, and a stairway to heaven made of old books with one hell of a view from the top. The staff member I spoke to, while not terribly friendly, did speak English and was able to point me in the right direction. There are some books in English, French, Spanish – mostly they’re in Italian, though. There’s really not much else to write about this place that other bloggers haven’t already So, here’s another set of photos from this little piece of heaven, because how could you possibly get sick of looking at these?! This place looks great…I’ve seen bits and pieces about it before but didn’t realise it was so cool! Wish I’d made a visit when I was in Venice! It’s so much better than I thought it’d be too! This marks the second post that reminds me of home in the same day! 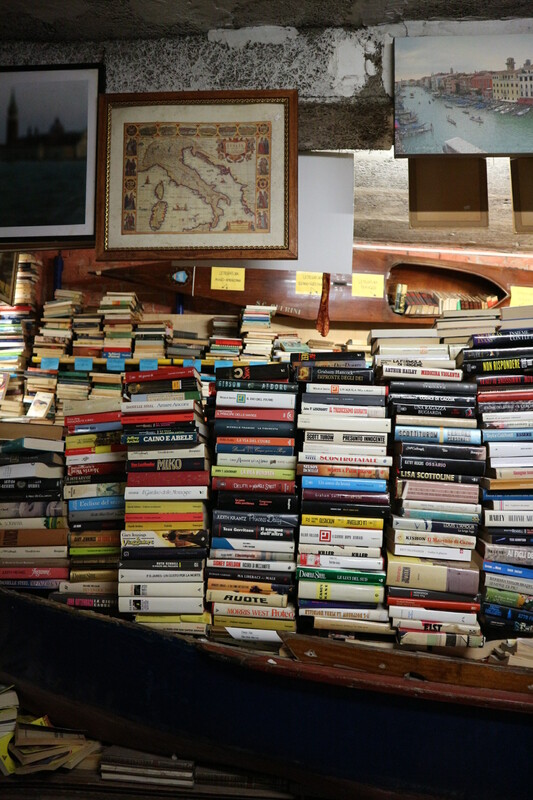 Libreria Acqua Alta is extraordinary – especially for me, I’m the kind of person who could spend a whole afternoon in a book shop, and this is one of the most beautiful book shops in the world! Can’t wait to go there once again! I’m so glad it brought back happy memories for you! I couldn’t agree more – it’s absolutely stunning! I missed this libreria! I shall pay it a visit next time I’m there. Well worth another trip to Venice!